You know that mate who always orders a vindaloo and acts like they’re the hardest person in the takeaway? Let me tell you they are a mere child. There are some seriously ferocious chillies out there, and now one has knocked the notorious Carolina Reaper from its fiery pedestal. 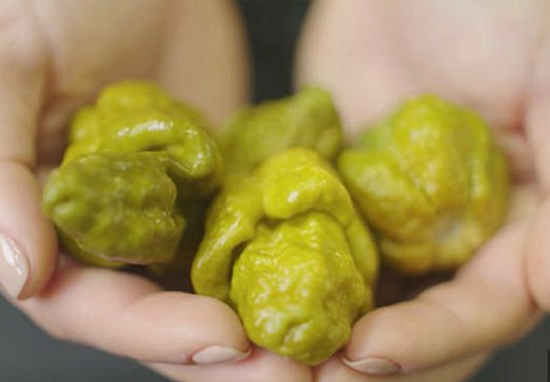 Pepper X is unlike anything you’ve ever tasted. Clocking in at a tongue-scorching 3.18 million Scoville heat units, this fireball from hell leaves the 1.4 to 2.2 million Scoville Carolina Reaper in the dust. For a point of reference those jalapenos you pick out of your burrito because they are just too damn spicy? These fellas are a comparatively tiddly-widdly 10,000 to 20,000 Scoville units. Although this may seem to be food fit only for dragons, if you’re feeling brave, you can taste this devilish delight for yourself in the form of The Last Dab Hot Sauce. This sauce is a collaborative effort between culinary genius/madman behind the Puckerbutt Pepper Company, Smokin Ed’ Currie, hot sauce purveyor Heatonist and First We Feast’s The Hot Ones show. Dream or nightmare team?! One Dab to rule them all. The Last Dab. When Sean Evans and the Hot Ones team were looking for a sauce to deliver the final sendoff, to squeeze the last juicy bits form their guests, they knew that no known pepper would do. So they came to HEATONIST. We partnered with Guinness World Record holding pepper breeder Smokin’ Ed Currie to create a sauce using his latest creation: Pepper X. More than simple mouth burn, Pepper X singes your soul. Starting with a pleasant burn in the mouth, the heat passes quickly, lulling you into a false confidence. You take another bite, enjoying the mustard and spice flavors. This would be great on jerk chicken, or Indian food! But then, WHAM! All of a sudden your skin goes cold and your stomach goes hot, and you realize the power of X. This franken-pepper was developed over the course of a decade and cannot be eaten on its own, for the obvious reason that it will blow your head off. Pepper X is three times hotter than any other peppers that are out there available commercially. It’s twice as hot as the Reaper at 1.6 million, so this is a dangerous pepper. Unperturbed by it’s ‘dangerous’ reputation’, spice fiends have gone completely nuts for this sauce, with the first 1,000 bottles completely selling out in just two minutes. However, you can still pre-order. New batches are created weekly in accordance with the growth of the peppers, and the sauce will be shipped as its made. So yeah… this happened today! We managed to acquire a small amount of Smokin Ed and Hot Ones collab sauce The Last Dab (I do mean small, we do not have any to sell sadly, just a bit to sample for the brave among you before anyone gets too excited!) This definitely has a very powerful kick, but a lovely flavour with the nice hint of mustard, turmeric and ginger coming through. For me (Tanya) the burn was very much on the tip of my tongue and roof of my mouth. #chillishop #chillishopleeds #leedscity #leedsshopping #loveleeds #shoplocal #supportsmallbusiness #spicyfood #hottestsauce #thelastdab #pepperx #hothothot #chillipepper #chillihead #? #? #??? A potential Christmas prezzie for the spice lover in your life?